Yes, you can make your house super efficient, but might not want to… yet. We visited the Corcoran neighborhood sustainability fair on 2/12/11 and saw two sessions: one was about deep energy reduction retrofitting, or DERR. Never heard of it before? We hadn’t either so we were fascinated with the idea that many typical Minnesota house, like ours, could be made more energy efficient than most new homes through retrofitting. The speaker was Tim Delhey Eian of TE Studio, residential passive house design expert. His presentation had several – “Yeah, that’s so obvious!” moments that left us shaking our heads about how we find ourselves in the state of affairs we do in this country. Tim pointed out that in most locations in the world, homes are built from local materials for local conditions. But in the U.S., we have basically the same building methods and materials regardless of which of 7 climate zones you find yourself in. So a house in Arizona is quite likely to be built the same way as a house in Minnesota. That just doesn’t make sense. Our houses are built “light.” He put up a slide of a tent surrounded by snow and said the typical American house (presumably built before the 70s) is just a bit more efficient than that tent. I know when my neighbors remodeled they found newspaper stuffed in the walls as insulation and the upstairs bedroom walls were made of cardboard with wallpaper over them! Not a lot of insulation value there. And our old windows were really only functioning to keep the rain out, certainly not the wind or cold. Tim also pointed out how odd it is that home values are primarily based on the supposed value of nearby homes, not on measurable quality of your home. So suppose your home is super-efficient, made with long-lasting materials, requiring far less energy and maintenance? Well, it’s still not going to be valued much above your neighbors’ homes under the system we currently use. Hm, that doesn’t make a lot of sense. So what is a deep energy reduction retrofit? It’s not weatherization. It’s not adding a bit of insulation in the attic or filling up a bypass or caulking and weatherstripping, or all of those things added together. It’s much more intensive than that. Adding a thick blanket of insulation around the entire house, from top to bottom (under the basement, or under the first floor and making the basement into cold storage). Replace the windows with super-efficient windows (Tim says the typical American-made window you buy at Home Depot or Menards will have an R value of 2.5 to 3, but the best German windows have R value of 8 to 10. The American window is expected to last 15 years, high end windows to 20 years, but the German window has a life cycle of 50 years). Use the correct type of window for the conditions (Tim points out that American windows are designed with glazing to keep sun out but in some locations, like Minnesota in the winter, it would be much better to let the sun in to take advantage of passive solar heat gain). Replace heating system and address air exchange issues to ensure moisture control. Tim said many home heating systems are chosen by taking the home’s heating needs and then doubling the furnace size so that our high-efficiency furnaces never operate at capacity. 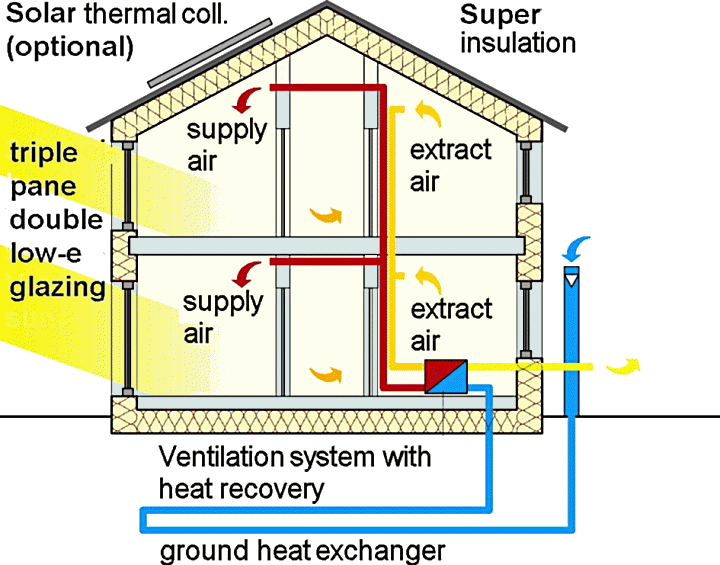 The more insulated the home is, the less furnace it needs. He has seen energy bills cut 70 to 90%. One of his demonstration projects became a zero-impact building. But the price tag for all of this is pretty steep — to do my house would be about as much as my current mortgage (which is half the price of a typical home in my area). Tim had a slide showing the “typical” American home on one side, and the super-efficient home on the other. Someone asked about what he suggests for people who are still struggling to get their house to look like the “typical” side? I had to laugh because we only arrived there this summer when we finally got the last area of insulation installed in the floor of the attic crawl space above the 1st floor bedrooms. It’s taken me 15 years to get to that point. It’s hard to do DERR work incrementally because a house is a balanced system – make a significant change in one area and it will affect other aspects of the house. Tim said you can look for natural break lines — the roof and the wall is one. You can do the roof now, walls later, but the windows will have to go along with the walls. He had another interesting observation about the value of paying down your mortgage versus the value of investing in energy efficiency. You know what your monthly mortgage will be, but you really don’t know what your utility bill will be because you don’t have control over all of the factors that make up that bill. Even if you could have absolute knowledge of your energy use, you don’t know what the cost of energy will be. Will the electric rate rise? Will the cost of fuel oil rise? This can be particularly challenging for large commercial buildings where heating and cooling bills can be hundreds of thousands of dollars. We won’t be wrapping our house in insulation any time soon, but I do want to learn more about what is going on in the walls of my 1915 stucco house. This entry was posted in Energy and tagged energy efficiency. Bookmark the permalink.